SHARPSVILLE — If Buhl Regional Health Foundation’s goal is for its grant recipients to coordinate with one another, it’s off to a six-figure start. The foundation awarded $172,000 Wednesday to eight organizations looking to help the mental and physical health of those in Mercer County. Two of those organizations began collaboration even before the grant award. This is Buhl’s first time going through the entire process, from creating a program, to accepting applications, and finally to the symbolic handshake. There will be two grant cycles per year, with the next cycle beginning December 18, which is when Buhl will begin to accept letters of interest. Funds for the grant come from the 2014 sale of assets from the non-profit Sharon Regional Health System to a private entity. The association was created to oversee revenues from the sale. 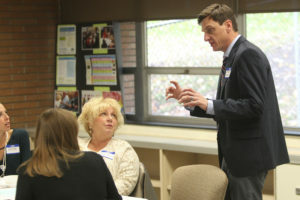 Kimberly Duncan, Buhl’s grants and projects manager, and Mickey Gula, Buhl’s executive director, said they hope health-related organizations will work together to address issues. 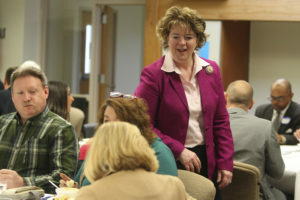 Gula hopes that by working together, organizations can address issues more efficiently, which would enable the foundation to help fund organizations outside of Mercer County, she said. CORY BYKNISH | HeraldEight organizations were chosen by the Buhl Regional Health Foundation to receive grant money for their efforts with the physical and mental health of Mercer County residents. Pictured are, from left, Ruthanne Beigley, Jason Kmick, Shellie Duchek, Brian Higgens, Jessica Jameson, Steven Edwards, Lauren Leskovac, Shane Weisen, Marc Benedetto, Kateri Linn and Michaelene Gula. 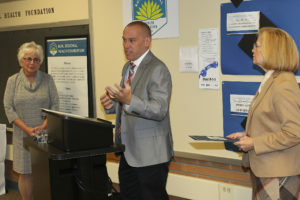 “Over time, as we grow and develop we hope we’ll be able to give out larger funds or support more agencies,” Gula said. Mercer County Criminal Justice Advisory Board and Mercer Communities that Care each earned Buhl grants. and are an example of the collaboration Duncan and Gula hope for. Both of these organizations have natural crossover in their lines of work. In addition, the volunteer staff has some crossover too. Lara Leskovac is the coordinator on the Criminal Justice Board and mobilizer and project director for Communities that Care. Mark Benedetto, Mercer County’s chief juvenile probation officer, is chair of Communities that Care and is on the Crisis Intervention Team for the Criminal Justice Advisory Board. “It’s a huge collaborative effort from any organization that has a stake in health and safety,” Benedetto said. The grant money for Communities that Care will go toward Aevidum, a student-driven club to improve students’ mental health. The Criminal Justice Advisory Board’s grant money will fund Crisis Intervention Team, a 40 hour training session that teaches police officers and first responders how to help people with mental health issues. Both organizations are striving for the same goal but at different ends of the spectrum—with Communities that Care at the preventative end and the Criminal Justice Advisory Board at the reactive end. “Prevention’s where it’s at. If you swim up stream you can stop all this stuff from happening,” Benedetto said. Buhl’s program has only begun, but seems to be going swimmingly for the grant recipients. Duncan said Buhl will check up on the grant-funded programs at the six and 12-month markers to ensure there is improvement. That, improving the lives of people in Mercer County and beyond, is the goal, said Duncan and Gula. Like Natalie Eastwood on Facebook or email her at neastwood@sharonherald.com. Pennsylvania Senator, Michele Brooks, showed support to the Foundation and the grantees with her attendance at the luncheon celebration.